With so many websites showing up on the web earning from CPC becomes super difficult. And affiliate marketing is tentative (no wonder it is super powerful but equally tentative) and that too has competition that makes your earnings so narrow that you are forced to maintain multiple sources of income from multiple sources. And in this post, we will see some Top CPM ad networks for publishers so you can earn from pure CPM ads which technically reduces the margin of revenue you miss when CPC ads occupy space on your blog. These best CPM ad networks for publishers in 2018 are proven to be the best “Adsense alternatives” before that let us understand more about CPM Advertising. What is CPM Advertising in 2018? How do CPM ads work? CPM advertising is a digital marketing term that denotes the price of ad per thousand impressions. CPM stands for Cost per thousand, don’t mind the “M” there it’s just Roman representation of 1000. If you charge $100 for CPM ads for direct advertising on your blog, the buyer must pay $100 for every 1000 pageviews of that page. Since the CPM ads/banner will load every time the blog post loads, calculating in terms of page views would be better. Since most of the ads on Google Adsense are CPC (Cost per click) it becomes really important to find a bypass that bridges the gap between CPC & CPM. Most of the ads are CPC ads since the working model of Google AdWords is so. The advertisers create ads on AdWords platform for which they pay “only” when someone clicks on their ads. Which in turn reflects on publishers blogs and directly affect their revenue. CPM is calculated as cost of a campaign divided by the total number of impressions multiplied by 1000. Each time an ad is shown on your page it is counted as a single impression. CPC or CPM? What’s better for your blog? If you are a beginner with little to no traffic, CPM ads will be a great way to start monetizing your blog right away. Since most of the CPM advertising networks have no minimum traffic volume criteria for successful approval, you have a good chance in this case. However, depending on your traffic, you will be earning. If your traffic too less, you should be optimizing the content for search engines. Search engine optimization will help your content rank high on search engine results page and higher the traffic higher will your revenue. CPC is the best with no replacement when you have huge traffic coming from search engines. As cost per click is higher for high traffic website. There are websites that have CPC of $100 and more, which speaks for itself that the traffic on that website wouldn’t be normal. That being said, let me share the best CPM advertising networks for small publishers. The leading popunder network with over 500 million impressions a day makes this network reach the top of this list. Ad-maven offers several monetization methods other than pop ads (interstitial, lightbox; banners and sliders are on the way) and is introducing new monetizations to our publishers as they move forward. They offer higher margin than other competitors which makes it more preferred network. Ad-maven enables you to bypass almost all major ad-blocks and hence increases your revenue by 35% which was not the case with those ad-blocks in place. The Ad-Maven products including Lightbox and Interstitial ads are fully compliant with Google Adblock scheduled to launch in January 2018 and will not be blocked. Payment methods available at Payoneer, Paypal, wire transfer, and Bitcoin. Ad-Maven payment terms are Net0, Net15, Net30. All website types are accepted including Adult traffic. Traffic from all GEOS is accepted. 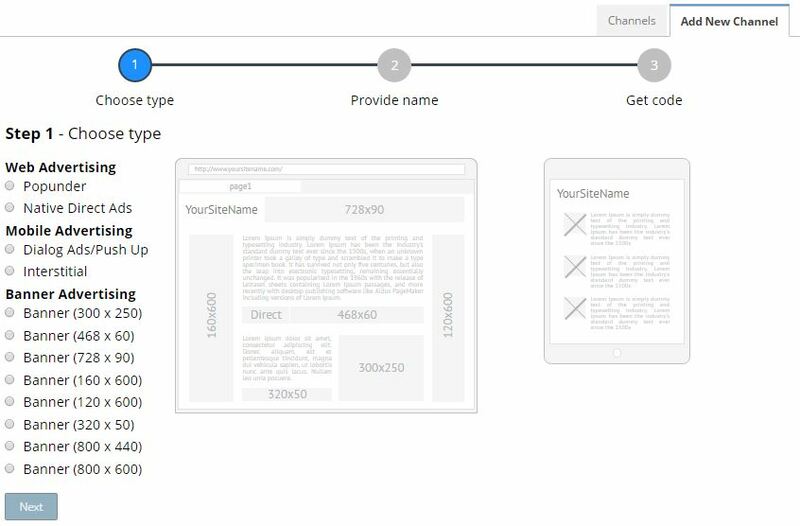 Set-up your site and select the type of ads that you want to be displayed. Generate revenue from those ads and leave the rest to ad-maven. Easy, simple and guaranteed approval is what I get in mind when I see Propeller Ads. It’s made for advertisers who are looking to show up to the crowd and for publishers who are super amazing traffic but CPC cuts of their huge margin of revenue. The reason for signing up for Propeller Ads is that it never rejects you. Even if your blog has low traffic or if you are a newbie it’s perfectly fine, Propeller Ads will welcome you onboard. See for yourself why propeller ads is a really good decision to for your blog. Payments are made through Payoneer, a leading payment gateway. It’s super easy to send and receive payments from across the globe through this gateway. Signup on Payoneer for free today and get $25 joining rewards. 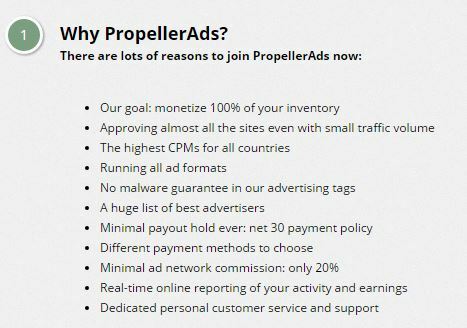 Create a free account on Propeller Ads. Navigate to Sites and add sites that you want to monetize. Once you add sites, it’s time to choose from a big set of option that Propeller Ads provide. Click on “New Channel” button and you will be redirected to ad setting window. Once you set up the channel(s) get the code and place it as per instructed or as per your need. Note: The type “popunder” is little annoying when used on mobile as sometimes the user will be redirected app store (if the ad is shown is of an app) which would result in user closing your site directly. This will affect your bounce rate and session time. Use it with caution. However, on a browser, it just opens a new tab which still keeps the user on your page and hence your bounce rate and session time is safe. Use this ad type in case maximum traffic on your blog is from desktop and not from mobile. Amazon being the favorite affiliate program among all comes in this list too. Though this program is not available for all as of now, you will need to register as an affiliate on amazon.com (US) and this is more or less a Native CPM ad network. Sign-up at amazon.com associate center and create your site(s). Navigate to Native shopping Ads under product links. Click “Create Ad Unit” button and select any of the ads available ad unit as per your needs and ideas. As per your selection, you will need to configure the ad unit. Copy the ad code and place the code on your blog. UberCPM pays using Paypal and best part is they have an instant approval even for Blogspot and Weebly bloggers. Only 3 ads are allowed on one blog but you can put the same code on other blogs of yours too. Sign-up and get your code. With these 2 steps, you can start your earnings, it’s that fast. The approval process takes 3 working days to process, and trust me it will get approved for sure. Of all the networks present in this piece, UberCPM stands out the best so far and my personal favorite. One more big name in the list is BuySellAds. This platform has no strict confirmation criteria but not lenient too. The quality of ads on this platform is its strength. This platform is really flexible when it comes to setting CPM rates. One of the most trusted platforms for monetizing your blog with an advertisement. Ideally, within 3 days you would get the email on approval/denial of your application. Sign up on BuySellAds as a publisher. Setting up a property (sites) is a mandated step, after which the approval takes place. Once your property is approved, all you need to do is configure an ad unit and get the code. First-time users, here are some tips for ad placement and management. 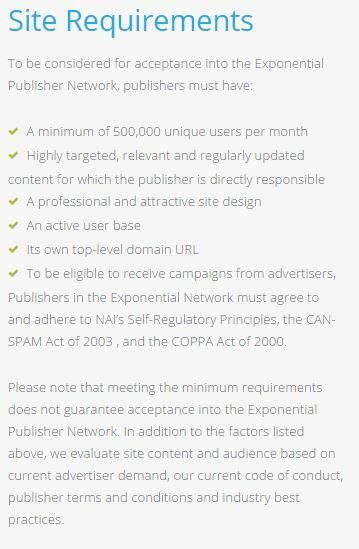 A premium ad network that is very strict in an approval process. They require a minimum of 500,000 monthly unique users hence this is not for beginner bloggers. The reason I have included this in that the quality of ads on this platform is really fine. Since they are very strict in the approval process, they offer a whopping 55% share for each sale made. It’s a win-win situation for both the platform and the publisher. The platform gets only high-quality blogs to advertise on and the publisher gets maximum profit for the huge traffic their blog has. Considering the quality of ads served, the requirements are quite strict. Here’s list of the requirements that are considered before approving your application. Sign-up here and complete your profile. Once your application is approved you are free to experiment with various ad choices served by the platform on your blog. Webmaster’s favorite network that has started gaining a lot of limelight in the recent times. It has partnered with Google Adsense, DoubleClick, and many such top names. Apart from these top 5 ad networks, there are few others worth trying. I would recommend experimenting all these ad networks before you choose one permanent network. Adding more ads would dramatically affect your site load speed and might hinder in user experience. With so many ad networks in action, it’s sure that your revenue can shoot up like a tracer bullet. The only thing you have to do is be consistent in creating quality content and reaching the right audience and right time. Rest will be taken care by ad networks listed here that you rightly choose for your blog. Should you face an issue in anything related to networks mentioned here, feel free to comment down below. Also, share this content to reach maximum newbie blogger and let’s help them grow too. As far monetization is concerned, no doubt Google Adsense is the best choice for monetizing your website. While there are chances that for various set of reasons you cannot or may not be able to use Google Adsense, that gap between your efforts and monetization will be bridged by Best CPM Ads networks for publishers will come handy. Depending on your traffic and content you can choose from listed CPM Ad networks. Over to you, Which CPM Ad Network are you going to use first? Where there any CPM Ad network you’re familiar with on this list? Let me know in the comments below. Do you know someone who’s looking for this information? Share this with them. Also, share this piece of information on your network.